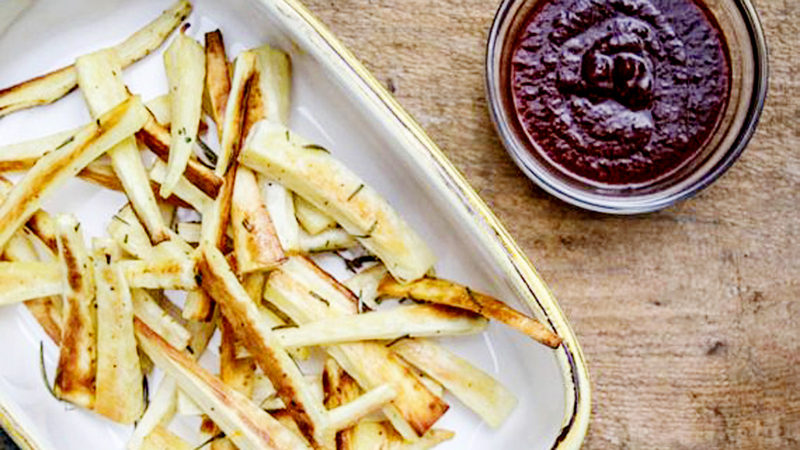 Parsnip fries are a delicious and healthy alternative to regular French fries thanks to their lower dose of carbohydrates and sugars. These taste amazing alongside fish, chicken, or black-bean burgers. Recipe courtesy of Andrea Bemis, chef/writer of Dishing Up The Dirt and owner of Tumbleweed Farm, in Hood River, OR. Preheat the oven to 450F degrees. Toss parsnips with rosemary, garlic, olive oil, salt, and pepper. Place on a lightly oiled baking sheet. Bake in the oven for 15 minutes, tossing parsnips halfway through cooking time. Parsnips are done when lightly browned and easily pierced with a fork. Do you serve these solo or with a dipping sauce? These are really tasty by themselves, but you are welcome to add a dipping sauce such as a sugar-free ketchup, or home-made cashew cream, see recipe from Andrea Bemis, https://ohmyveggies.com/carrot-fritters-with-cumin-lime-cashew-cream/.